This city, of immense historical importance, is towards the south of Lahore. Till 1972 it was part of the Lahore District, when after the separation of Lahore and Kasur, it was made part of the Kasur District. It still is a vital city, in economic and political terms; however, the influence that it enjoyed once is no longer exists. During most of the Mughal era it served as a Chaoni, or cantonment area. Arms and ammunition for the royal army were made here on a massive scale. Towards the Western side of the city remains of large pieces of iron are found; relics of the arms factory. As one explores historical records and books, one would find numerous references to this city. The list is so long that it would not be possible to narrate all of them here. A few of them eliciting the significance of this city are mentioned below. According to the Archaeology Department report, there are 7 major mounds here, categorized into two. Category A; belonging to the era after the 16th century CE, and B falling in between the 11th and the 16th century CE. Some of the latter mounds, not of archaeological importance, were formed during the massive flooding of the 18th century in Beas River. These mounds encompass the city, serving as picnic spots for the residents. According to the Encyclopedia of Sikh Literature, Chunian is the plural for Chuni which means pearl. It is believed that this city was originally inhabited by Chodas, or the untouchables. During the Mughal era, there was a Muslim Saint known as Peer Jahania. When he came here he converted all of these people to Islam. Chunian, meaning pearls is a symbolism for the untouchables. According to this narrative the tomb of the Peer Jahania becomes the most important location of the city. This is where the Saint is said to have established himself. 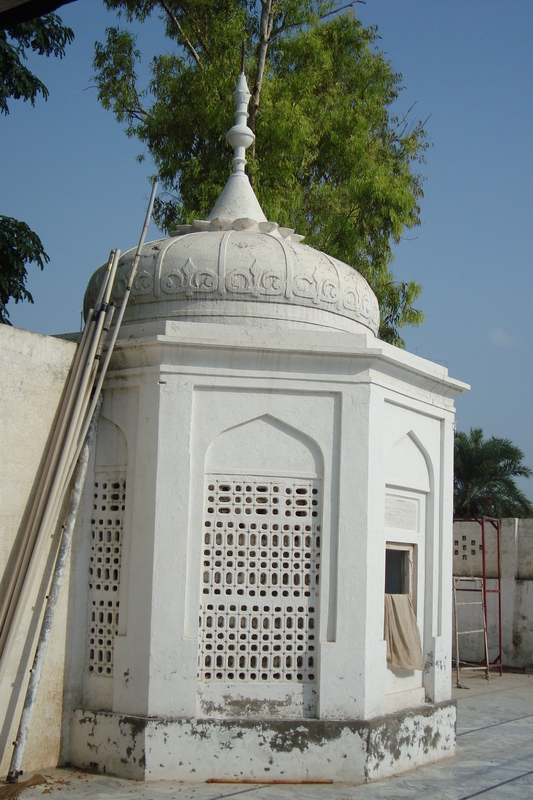 The tomb is accompanied by a modern mosque, in the courtyard of which is a small building, depicting pre-British era architectural techniques. This marks as the spot where the Sufi used to sit. It is empty from the inside. In Tehrikh-e-Cambhon written by the police inspector Abdul Wahab Amritsari, he narrates a story that takes back the history of Chunian, all the way to the arrival of the Arabs in Sindh. He describes that when Muhammad Bin Qasim attacked Sindh, Chunian was being ruled by a man belonging to the Cambho clan. He had a daughter and a son. This city was under the sway of Multan, so when the Muslims got hold of Multan, Chunian automatically fell in their lap. They demanded a large amount of compensation from the ruler. He retorted that since it was a huge amount he should be allowed to make the payments in installments. He was permitted to do that, but Muhammad Bin Qasim asked for a guarantee in return. The King gave him his boy, Maha Chawar, who was taken by Qasim to Arabia. Living under Muslim influence, the boy embraced Islam. Five years later when the King of Chunian was able to pay the entire amount, the Prince was allowed to return. However, instead of being welcomed back, Maha Chawar was castigated for having abandoned his religion, and being polluted by the ‘barbarian’, by the Hindu priests. It was decided that he should be returned back or be killed. Since the boy had just come back, there was no option of him returning, so plan B was to be executed. His sister Kangna heard of the plan, and along with her brother fled the city. The army of his father kept on following the siblings, until they were intercepted at Mandi Borewala, where they were murdered. Later Muslim rulers built a tomb there to commemorate their memory. Today the mausoleum stands, known by the name of Diwan Chawali Mushahiq Haji Muhammad Sheikh. Kanganpur, a village in the tehsil is named after Kangna, according to this story. However, besides the mounds there is no building or any other such remains from that tenure in Chunian. Most of the old buildings have been replaced by new constructions. A few of the balconies, doors, and havelis that are left, are in dilapidated state and not any further back then the Sikh era. The present city of Chunian came into being in the Mughal era, when the royal arms and ammunition were being manufactured from here. It is standing on a mound, originally protected by a wall with various doorways. Not many are present today, and the traces of the wall are also missing. At its zenith the mound has to be about 40 feet above the ground. Tajamol Kaleem, local Punjabi poet was kind enough to entertain and show us around the city. Towards the eastern side of the city, near the old route of river Beas there is a non-functional Jain temple. At the start of 2010, a controversy arose regarding the building. Accompanying the edifice is a Wahabi mosque, members of which wanted to take over the building and use it for its own purpose, according to Kaleem. However, Kaleem, along with other friends reached the spot, before the action could be taken, and presented the case in such a manner that the local elders refused the mosque to take over the temple. It was argued that the sanctuary was an Imanat and a Muslim doesn’t renege from his promise. At least temporarily the tension has been defused. There was still apprehension in the atmosphere when we reached the spot to take a few photographs. Hostile looks followed by a few tirades greeted us. Nearby was the Harchoki gate. As most of the historical doors, this one is named after the historical village of Harchoki, towards which it faces. In the 18th century CE, an epic war was fought in the fields of the village, also wrapping within it the city of Chunian. This entire episode can be found in the famous book Punjab Chiefs, by Sir Lepel H Griffin. In the early 16th century CE, when Babar was on his way to capture the throne of Delhi, there was an internecine war in Afghanistan, which led to an exodus of many Pathan tribes. They met Babar on the way, and helped him in winning the decisive battle of Panipat in 1525. As a result of their loyalty to the Mughal they were given impressive titles, and control of Bengal. In 1569, when Jahangir was borne to Emperor Akbar, after the lapse of a lot time all of the notables came to pay homage to him, expect these Pathans. Akbar angry at their insolence demanded that all of their titles and property be taken away. When they started returning to Kabul, the King realized that they were a huge asset to the Mughal Kingdom, therefore he send Abu Fazl, the composer of Akbar-Nama to console them. They were given the permission to settle anywhere, which is not near Delhi. They settled for Kasur. At that time the ruler of Chunian was a man called Raja Rai. Pera Baloch a ‘dacoit’ from here was a source of irritation to the ruler. When the Pathans commenced making their forts here this ‘dacoit’ also started attacking them, taking away his loot in the darkness of the night. Finally, in a fight he was killed, by the Pathans, which went on to establish their authority in the region of Kasur and Chunian. In 1720, the Pathans descended on the fields of Harchoki, along with Nawab Hussain Khan, ruler of Kasur, the mayor of Chunian, Sardar Fazl Khan, against the might of the Mughal Governor of Lahore, Abdul Smadh Khan. From the very beginning the former group was destined to lose fighting with only a force of 10,000 against an army of 70,000. The death of Nawab Hussain Khan in this battle translated into a defeat for his army in the battlefield. This historic battle however found a way into the cultural psyche of the people of Punjab. It became a symbol of rebellion against an oppressive tyrant. It is also evoked in the famous Heer by Waris Shah. Symbolism of this battle in Heer is a useful yardstick to gauge the importance of this town in the cultural history of Punjab. Despite language and cultural barriers, Heer goes on to unite the people of Punjab under the banner of Punjabi nationalism. There is however, another folk tale originating from the city of Chunian, much larger in its scale of influence than Heer. This is the story of Sassi Punnon connecting Punjab with Sindh and Baluchistan. It is generally believed that Sassi, the protagonist in our story was the daughter of King of Bhambour. However according to an article published in Imroz in 1970, written by Advocate Syed, Sassi was born in the city of Chunian, from where she reached Bhambour in a basket as an infant, when her life was threatened by the prophecy of a female bringing shame to the city. If credibility is to be allotted to this version then this folk tale originated from this city. Chunian today, even though donning a modern garb, represents a traditional city that has continued to hold significance over the years. Despite the fact that most of the older buildings, e.g. the Shah Jahani mosque near the tomb of Peer Jahania, and other forts and gates of the city have been lost, the ambience of the city takes one back in time, connecting its past with its present. A journey to Chunian therefore is more like a journey through time, which becomes much more meaningful if its importance has been established as a crucial city in the folk lore of Punjab. Last week, accompanying a visitor from the Mecca of Sufis, Delhi, I reconnected with the Data Darbar or the royal pavilion of the great saint of Lahore, Ali bin Usman Al Hajveri. This shrine is the oldest and perhaps the most vibrant cultural marker of the past one millennium in Lahore. The title of Ganj Bakhsh was bestowed by the saint of the saints Khwaja Moin ud din Chishti of Ajmere, whose ascendancy in the Chishtia Sufi order is recognised by all and sundry. Pilgrimage to Ajmere by itself is a matter of spiritual attainment for the majority of Muslims in the subcontinent. It is not difficult to imagine then what the stature of Lahore’s Data Darbar is in this esoteric yet real and lived Islam in South Asia. While Khwaja Moin ud din Chishti honoured the Lahori saint with the title “bestower of treasure,” ordinary folk on Lahore’s streets were more direct by naming the saint as Data, the one who facilitates the fulfilment of aspirations. Living nearly 11 centuries ago, Syed Ali bin Usman Al Hajveri was not a Lahori but a resident of Lahore’s cultural step-cousin, Ghazni, until he arrived in India and wandered in northern India before settling in Lahore for the last 34 years of his life. This was the time when mystics from Central Asia, in their constant urge to discover new vistas of spiritual exploration, started to travel and settle in different parts of the Indian subcontinent. It remains a mystery as to why Data Ganj Bakhsh would have chosen Lahore as the final stop in his life long journey. Perhaps the secular interpretation could be that Lahore was an inevitable stop over for all the Central Asian and Turkic caravans and armies and provided the right kind of environment for a foreign mystic to amalgamate into. A little before Ganj Bakhsh’s arrival, Lahore had been resurrected from the earlier ravages of time by the Ghaznavid ruler Mahmood and his son Masood. Lahore’s fame had also spread deep into the rugged, mountainous climes of Central Asia. Its old fortified city, the banks of a gushing river and the motley collection of artisans, masons, artists, poets and musicians were all too well known. During the 34 years of his Lahore residence, Ali Hajveri became the most revered of dervishes whose inclusive and tolerant mystical path attracted the majority of its non-Muslim population. Let us not forget that the non-Muslim population was also a subject of a pernicious caste hierarchy where access to templar gods and clerical blessings was denied to a good number of the population. This was the beginning of a centuries’ long process of peaceful conversions. Islam’s egalitarianism and its larger message of equality before God was quite a magical idea for many, not to mention that the Sufi path did not require conversion per se. This is why Data Darbar has been a hub of inter-communal quests for spiritual attainment. Other than that, Ali Hajveri’s important contribution to the corpus of documented mystical thought is the treatise that he authored and left for posterity. Known as Kashf- al- Mahjub, or “Unveiling of the Hidden,” it is a monumental document striking for its communicative tone and systematic way of discussing mysticism. Through the dynasties that were to follow Mahmood Ghaznavi’s controversial military campaigns, the primacy of Ali Hajveri’s shrine continued. Its centrality to the evolution of Muslim rulers meant that the origins of Islam were paradoxically not rooted in the capture of power. Voluntary conversions at Sufi khanqahs and dergahs were a constant process. The Sultans of Delhi and the Moghuls were all enamoured by the mythical might of the saint, and while the imperial grandeur continued, the ordinary Lahoris had already renamed Lahore as “Data ki Nagri”- Data‘s city. Khawaja Moin ud din Chishti undertook 40 day long meditative exercises at this shrine before he moved to Ajmere to carry on the Sufi mission of spreading love, tolerance and harmony and of re-emphasising the indivisible equality of man. The Moghul prince and heir apparent Dara Shikoh, like his great-grandfather Akbar, was also a true devotee of Data Ganj Bakhsh.